Kirstenbosch Craft Market takes place on the last Sunday of the month, except for December when it usually takes place on the second and third Sunday. The market consists of approximately 180 crafters selling genuine hand crafted goods. This is a genuine craft market (not a flea market). Beautiful garments for children and adults, stationery, jewellery, glassware, ceramics, childrens dress up clothing, knitwear, plants and hanging baskets are just some of the multitude of items on offer. The variety of food and drink available, including delicious pancakes, the best falafels in Cape Town, and halaal food along with loads of free parking, ensures a relaxing atmosphere. There is no need to bring cash as the Info office in the Stone Cottage offers customers credit card and debit card facilities for purchases from most of the crafters. 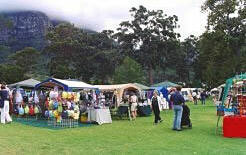 All proceeds from stall rentals go to improvements to Kirstenbosch Garden! When: Hours are 9:00 to 15:00 and entry is free. Dates for 2011: 27 Nov; 11 and 18 December. Dates for 2012: 29 Jan; 26 Feb; 25 March; 22 April; 27 May; 30 Sept; 28 Oct; 25 Nov; 9 and 16 Dec. The market is closed in June, July and August. 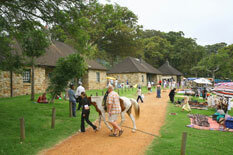 The market is situated diagonally across the road from the main entrance to Kirstenbosch Garden at the historical Three Stone Cottage (built circa 1918) grounds. Corner Kirstenbosch & Rhodes Drives, Newlands, Cape Town.